Infrared saunas use a certain type of wavelength of light, called infrared rays, to generate heat. This type of heat is very effective at raising your core temperature and heating up your body. The heat penetrates your tissue deeper than other heat and is useful for detox, enhancing immune function, lowering blood pressure, promoting muscle recovery, and improving circulation. What Are the Benefits of Infrared Saunas? Saunas help to detoxify the body through our body’s largest organ of elimination, the skin. The heat helps to mobilize toxins, including heavy metals, which are stored in fat cells. Sweating helps eliminate these impurities through the skin, thereby decreasing the body’s toxic burden. The heat from the sauna elevates body temperature, which can help the immune system to effectively clear infections, as many pathogens including Lyme disease, cannot live at increased temperatures. By bolstering the immune response to illness, and improving the elimination of toxins and wastes via sweating, saunas help to increase your overall health and resistance to disease. Saunas also help improve circulation and blood flow, thereby nourishing skin and healing soft tissue such as ligaments, tendons, and joints. Increased blood circulation helps repair injured tissue faster by carrying off metabolic waste products and delivering fresh, oxygenated blood to oxygen-depleted tissue. 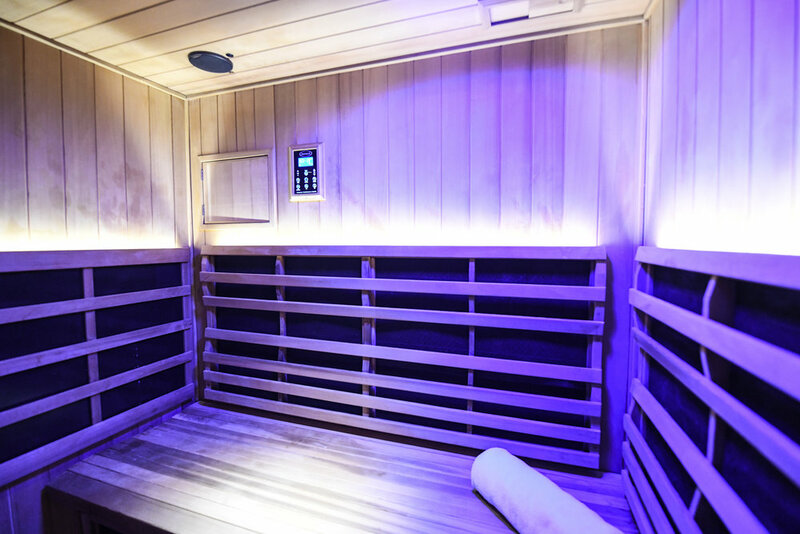 The deep heat of infrared saunas helps peripheral blood vessels dilate, bringing relief and healing to muscle and soft tissue injuries and disorders including bursitis, fibromyalgia, and acute and chronic pain. Weight loss is another potential benefit of sauna therapy. As the body works to cool itself, there is a substantial increase in heart rate, cardiac output, and metabolic rate, causing the body to burn more calories. Our Portsmouth location offers halotherapyy as an adjunct treatment in our infrared sauna. halotherapy, or salt therapy, is the therapeutic practice of breathing in very small particles of dry salt, which can have a beneficial effect on respiratory, sinus, and skin health. The practice originated in the 1800’s, when it was noticed that salt miners did not experience respiratory issues that were common to other miners. Salt caves became a popular treatment in Europe for people troubled by respiratory problems and in recent years, salt rooms have been fashioned to mimic the effects of salt caves. When very small particles of salt are inhaled, they coat the lining of the lungs and draw water into the airway, thus thinning mucous and making it easier to raise. This helps clear congestion. Salt is a natural anti-inflammatory, antibacterial, and antihistamine. When you breathe in those salt particles during salt therapy, it may reduce inflammation in the lungs and sinuses, help clear mucus, and even increase lung capacity. The anti-inflammatory and antimicrobial properties of salt may also help with skin issues, like acne, eczema and psoriasis. At Flōte Portsmouth, we offer the option of incorporating halotherapy into infrared sauna sessions. We recommend being well hydrated and eating a meal or snack prior to your session. Drinking 32-64 ounces of water before and after your appointment is recommended to maximize the detoxification encouraged by the infrared therapy. The sauna is in a private room and clothing does not impede the infrared waves. You can choose to go without clothes or to wear what you will be comfortable in. We provide towels and water. 30-minute $25, for stand alone treatment, without heat. Halotherapy is available at our Portsmouth location only.